The organisation of the Ichiyo school of Ikebana was first established in March of 1937. The style of arranging is contemporary including free from Moribana Nageire, and Ichiyo Seika.One special feature of the school is the manner in which it’s students are quided in instruction from the begginer to teachers level. The method of teaching is readily understood by everyone and is so designed that those studying are able to make progress in a relatively short period of time. There are many styles of flower arranging in Japan and each and all of them are taught in their own respective ways.The scientific teaching method which the Ichiyo School has created makes use of textbooks and other visual aids. This method is a effective and easily understood by everyone. Each course covers 20 lessons with the aid of textbooks and effcient instruction. Upon satisfactory completion of each course students may apply for a certificate. Each course consists of 20 lessons normally given normally given with class instructions through the aid of text books. Students of the Correspondence Course receive the same testbooks plus an additional instruction manual. Their progress is supervised by Akihiro Kasuya, Head master “Iemoto” of the School. Students may refer to the Headmaster on any uncertainties, difficulties, and questions which may arise during the course of study. The course of study may begin at any time throughout the year. The tuition fee for any course is to be prepaid. Upon receipt of payment the instruction material will be sent by air mail in acknowledgement of payment. No refunds will be made after materials have been forwarded. Upon completion of each course, the student must submit clear photographs on each style taught in the course for examination times with different materials. The pictures must be secured in noations of the date, the container, and any other pertinent information which the student wishes to comment upon. Upon review, the Headmaster will return the sketchbook along with his comments and suggestions. Students should be prepared to take at least one lesson a year, at their own expense, by aqualified instructor of the Ichiyo School. This may mean travel to a location where ther is such an instructor, or taking advantage of any Masters of the School who might be travelling in the student’s area. Upon satisfactory completion of each course, a certificate is awarded by the Headmaster. The cost of this certificate is included in the course fee. Upon completion of the instructor’s Course a certification as an instructor of the Ichiyo School is conferred upon the student. She/he may then be allowed to represent the Ichiyo School in her/his area. 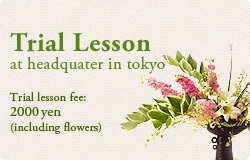 Persons may neither teach nor instruct Ichiyo Ikebana unless they hold an instructor’s certificate from the Ichiyo School.